One of the most popular fitness trends of 2019 was the CrossFit phenomenon. Dedicated gyms gave followers a place to perfect their WOD (workout of the day) while finding motivation from like-minded men and women. CrossFit is not going out with the old but will be very much a part of this new year. If you’ve thought about joining the craze, let us be your guide. In the year 2000, Greg Glassman created a workout program that has become known as CrossFit. This program is a short workout that involves high intensity functional movements for the entire body. The idea is to push one’s self as hard as possible for a short amount of time, sometimes even less than 20 minutes. CrossFit involves many dynamic exercises such as plyometric jumps, Olympic lifts, sprinting, rowing, jump rope, flipping tires, body weight exercises, weightlifting and even climbing a rope to the top of a ceiling. If you’ve been to a bootcamp, it looks very similar. In terms of weight lifting, we aren’t just talking about your average dumbbell, but other non-traditional weight lifting equipment. Some of these might include sand bags, kettlebells, water-filled containers, and suspension systems. The goal during this very high intensity workout is to perform a certain number or repetitions in a certain amount of time. Some athletes who take CrossFit classes are even scored and ranked in order to encourage competition and to track progress. For those who are more advanced, some will even compete against one another in person and then post their results on the CrossFit website. 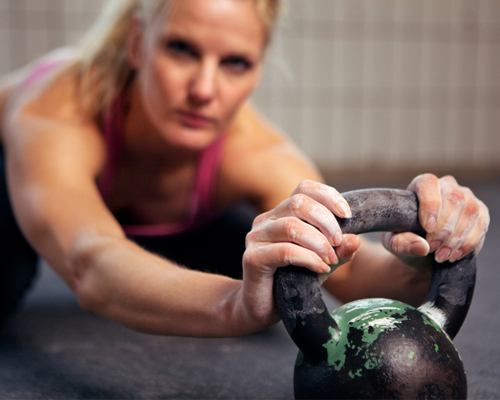 What are the Benefits of Crossfit? Many benefits come from taking up CrossFit. For one, the number of calories burned is very high, especially for the very short amount of time it takes to complete. It also improves all around aerobic fitness. It makes use of the anabolic hormones that promote muscle growth and can even trigger an anti-aging effect. In simple words, it helps keep you healthy, strong and youthful. The benefit list continues with much more including increased endurance, stamina, speed, power, flexibility, coordination and balance. Oh, and don’t forget the mental side of it all…”mind over matter” as the CrossFit athletes like to say. In order to work your way up to CrossFit, one would need to ensure they obtain good joint mobility in places like the ankles, hips and shoulders as well as joint stability in the core. If someone is not flexible enough in these areas, their body could easily be restricted from full range of motion, which could then cause injuries and/or affect muscle tissues. It may be best for certain individual beginners to first work with a personal trainer in order to physically prepare themselves for the exciting new world of CrossFit. If getting a personal trainer is not an option, here are a few examples of workouts a beginner can do in order to get in shape for CrossFit. In the end, you’re going to learn what it means to push your body as hard as possible with CrossFit. Check out the exciting video below for a visual summary of what to expect during a workout. If you’re ready to dig in, try this CrossFit WOD with Bob Harper and Jillian Michaels. Participating in an active and healthy lifestyle is a top priority for Danielle Lagow, and she puts those ideals into action every day. She is a senior at Wichita State University, and splits her free time between gigs at DietsInReview, a local health club, and training as a bodybuilder.